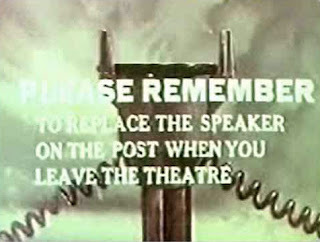 The Midnite Drive-In: Oh, NO! Not Costner, Again! I will be up front, at the beginning. I loathe Kevin Costner. 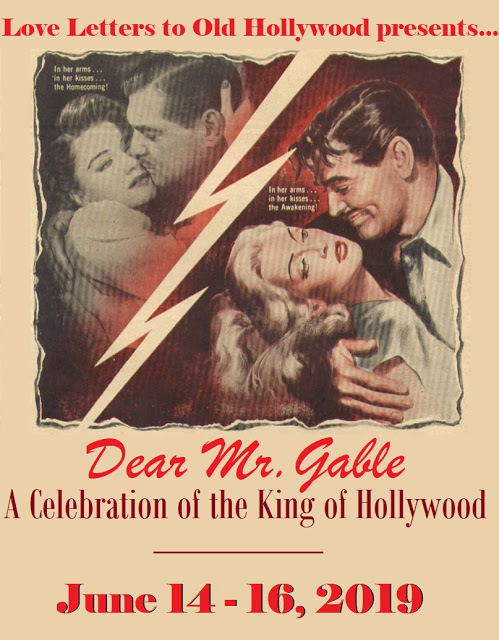 Many of his movies go on for about 2 hours AFTER I get tired of watching him. The Postman and Waterworld are two of the most egregious examples of how what is essentially a 30 minute TV show can be expanded to interminable lengths, forcing one to put up with crap that would have prison inmates claiming "cruel and unusual punishment". I am also not a fan of Dances with Wolves, but I realize I am in the minority there. This is not to say I don't like ANY movie that has Costner in it. I think The Untouchables was fantastic, but even Costner couldn't ruin a film featuring the great Robert De Niro (and Sean Connery, to boot). 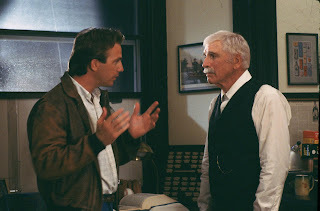 And, truth be told, I am not so negative about his performance in Silverado, but there is also enough of an ensemble cast in that one that he, fortunately, doesn't command the screen time that he would in later films. On the same note, I also hate sappy, feel good movies. It is for this reason I would never linger on the Hallmark Channel for longer than it takes me to realize I HAVE stopped channel surfing on the Hallmark Channel. Maybe its because I have such a cynical outlook on life, but chipper Pollyanna-ish characters tend to make me wanna barf. 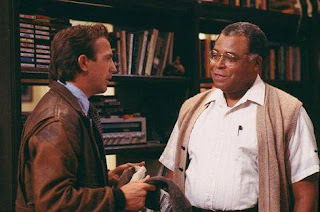 Put "sappy, feel good" together with Kevin Costner and you have the makings, for me, of an ulcer that a full box of Alka-Seltzer couldn't remedy. So it goes without saying that I'd find Field of Dreams one of the most annoying movies ever made, right? Well, that would be absolutely true. The whole thing just reeks of hippie hopefulness and unrealistic optimism. And yet... 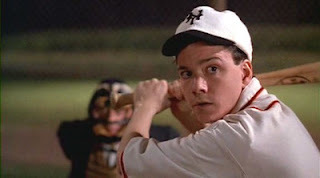 I do watch it, and even me, the hard-hearted cynic, can't help but find out someone stuck a water faucet behind my eyes when the pivotal scene occurs in which the young baseball player Archie Graham steps across the base line that marks the boundary of the titular field of dreams, to become the elderly Dr. Archibald Graham in order to help an injured child, and it is revealed that he can't go back across the line. 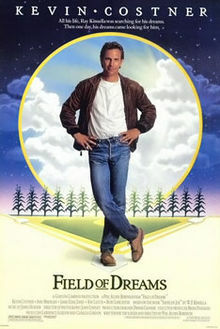 Most of the movie centers around either Ray's (Kevin Costner) attempt to transform his Iowa corn field into a baseball diamond, or his attempts to quell the voices in his head trying to get him to do these weird things he does in the movie. Spoiler alert! 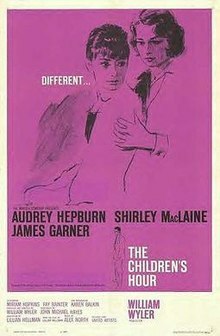 : This review covers the entire movie, including the ending, so don't read any further if you want to watch it first. 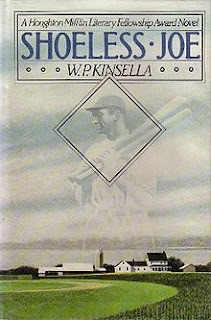 The story, based on a novel, Shoeless Joe by W. P. Kinsella. In the novel the main character, Ray, is told by a voice "if you build it, he will come", which Ray takes to mean his baseball hero "Shoeless Joe" Jackson, one of the disgraced members of the 1919 Chicago White Sox team that threw the World Series for payoffs from the gambling community. 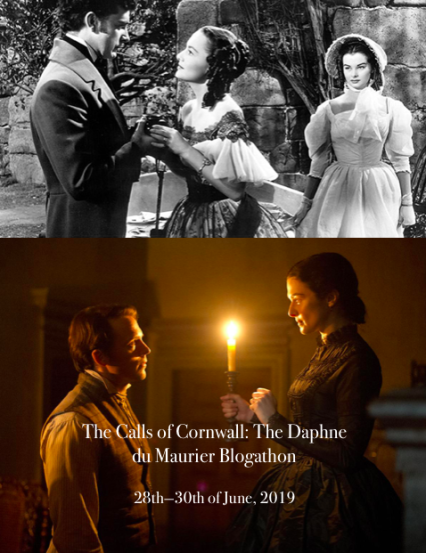 The movie follows the book predominantly, with a few to be expected changes here and there. 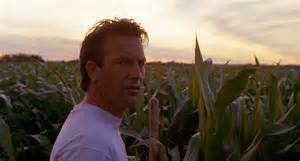 In essence Ray is obsessed with building a baseball field in his cornfield. 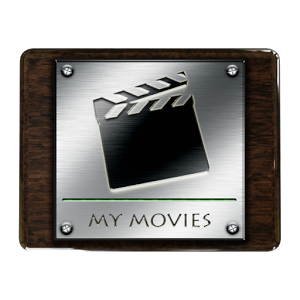 His wife, Annie (Amy Madigan), is supportive of him to fulfill his dreams. (And herein is one of those annoying parts of the movie. I find the hippie outlook evinced by Madigan as Annie to be extremely grating. There again is my own pessimistic outlook on life judging the character, but be that as it may.) Annie's brother, Mark (Timothy Busfield), is a realist. (Not too much unlike myself, I guess.) He tries to convince Ray that the farm is going to go down the tubes and that he, Ray, will lose it unless he replants the plowed under corn. Ray goes to Boston and essentially kidnaps Mann and forces him to go to a baseball game in Fenway park. While at the park, Ray hears another message; "go the distance". He infers this to mean he must get a one-shot player Archie Graham to his field. But it turns out Graham is dead and has been for years. He did, however, move on from his one-shot playing to be a renowned and well-respected doctor in his home community. While mulling this over, Ray somehow ends up back in 1972 where he meets the elderly doctor who expresses no regrets for missing out on baseball stardom. Ray ends up back in the present, and with Mann, drive back to Iowa. They pick up a young hitchhiker on the way, an ambitious young man who introduces himself as Archie Graham, and expresses a desire to play baseball. 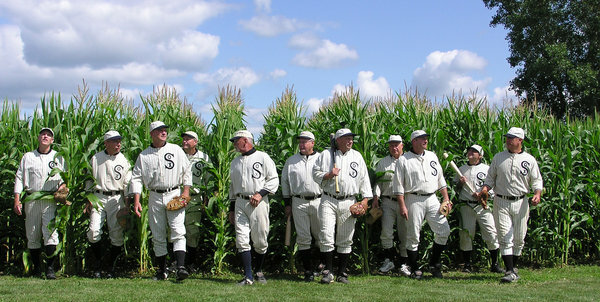 Ultimately, the three arrive at the cornfield/baseball field where "Shoeless Joe" Jackson, who had arrived earlier, has brought with him the other team members of the 1919 "Black Sox". They invite the young Graham to play with them. While they are playing, Mark arrives with papers to sign for ray to sell the farm. Mark does not see the players on the field, his mind is too closed to see the dream. While arguing with Ray, Ray's young daughter is knocked to the ground, unconscious. The aforementioned scene of the young baseball player Graham (Frank Whaley) crossing the foul line to become the old doctor Graham (Burt Lancaster) occurs at this point, and it would take a hard heart indeed not to well up in tears, especially after it is revealed he once again gave up his dream of baseball to do so. "Ray, people will come, Ray. They'll come to Iowa for reasons they can't even fathom. They'll turn up your driveway not knowing for sure why they're doing it. They'll arrive at your door as innocent as children, longing for the past. 'Of course, we won't mind if you look around,' you'll say. 'It's only $20 per person.' They'll pass over the money, without even thinking about it. For it is money they have...and peace they lack. And they'll walk out to the bleachers, sit in shirt sleeves, on a perfect afternoon. They'll find they have reserved seats somewhere along one of the baselines, where they sat when they were children and cheered their heroes. And they'll watch the game and it will be as if they dipped themselves in magic waters. The memories will be so thick they'll have to brush them away from their faces. The one constant through all the years, Ray, has been baseball. America has rolled by like an army of steamrollers. It has been erased like a blackboard, rebuilt and erased again. But baseball has marked the time. This field, this game...it's a part of or past, Ray. It reminds us of all that was once good and it could be again. Oh, people will come Ray. People most definitely will come." 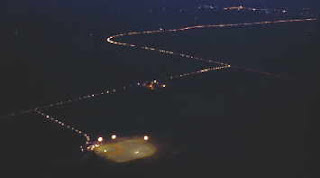 And the movie closes with a vast line of cars lined up to visit the "field of dreams."